The new Rock MK-III is available shortly and will feature the new 7" / 180mm Crystal Membrane woofer design as used in the Mini-Rock and Boulder MK-III models. 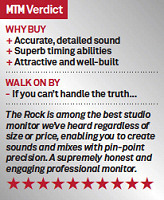 The Rock MK-III, like it's MK-II predecessor is an incredibly accurate, critically acclaimed 2-way active mixing reference near-field monitor, considered by many professionals to be the reference all others are measured by. Unlike many near-field monitors, the cabinet is a sealed enclosure that doesn't rely on a resonate port to deliver low-end performance.